Sunday, January 23: My last day in Cambodia, and though I’m burned out and want to just lie by the pool all day, I decide at the last-minute to see some more of the Angkor temples. After all, I can lie by a pool anytime, especially once I return to the U.S.A. The hotel picks one of the tuk tuk drivers from out front, from a group of guys they use frequently. They tell me they don’t recommend using random drivers from the street because they are undependable and end up changing the price halfway through. So, I hop in the tuk tuk with this guy. It’s quite a long ride in a tuk tuk to the temple complex because the vehicle moves so slowly. About halfway to our first temple, Preah Khan, the driver tells me I should take my time at this temple. He suggests that I take an hour and 40 minutes. I say, No! I don’t want to spend that much time at any of these temples today. I just want to have a quick look around and then move on. I tell him I’d like to be back at the hotel to lie by the pool for a while before my flight home. He proceeds to tell me that yesterday, he arranged with some people to pick them up at their hotel and take them to the airport. They never paid him his fare from yesterday, so he needs to do this after he drops me off at Preah Khan, to meet his obligation with them and to collect his fare. Now, I know how far the airport is and how far Siem Reap is from the temple complex and I know how slowly a tuk tuk moves. 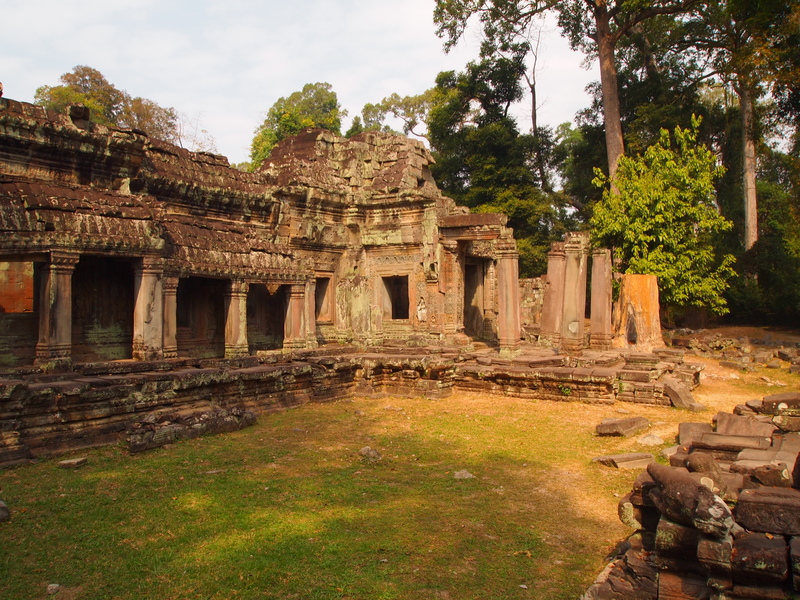 I tell him, no, I’ve arranged to have him for the day, and I only want to spend 45 minutes at Preah Khan, and then move on quickly to the next temple. But he insists he has to go pick up these other people. 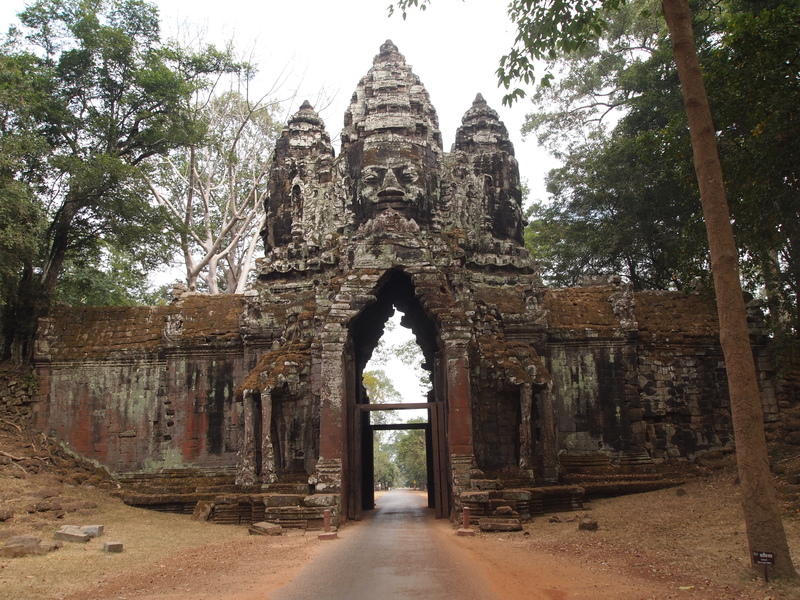 We agree that he should pick me up in 45 minutes at the far (east) gate of Preah Khan. I say if he is not there in 45 minutes I will take another tuk tuk and he will lose out on his fare for taking me to Preah Khan. He leaves me and I walk through Preah Khan (Sacred Sword), one of the largest complexes at Angkor. I like the entrance over the moat with its decapitated demons and gods. 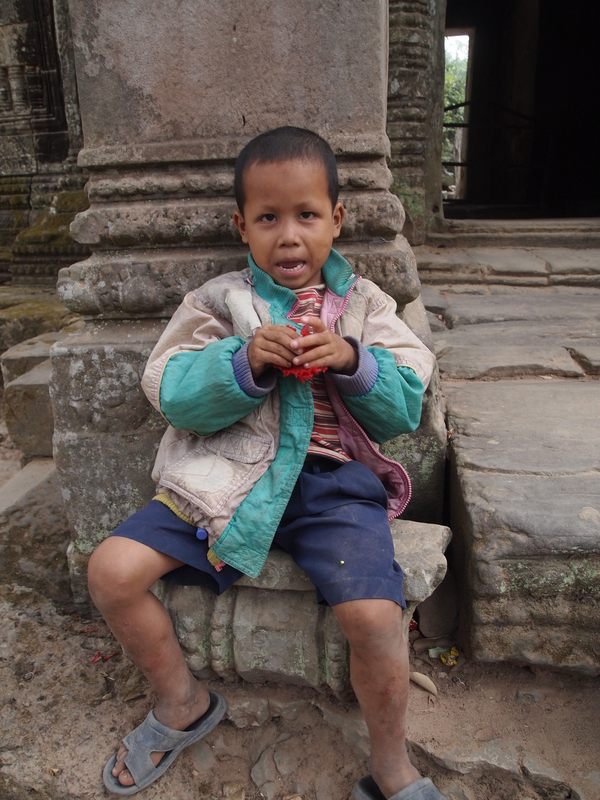 I run into several poor and dirty Cambodian children sitting on stone stoops, trying to get handouts from tourists. I walk around through the complex admiring all the beautiful carvings of Apsara dancers and kings. 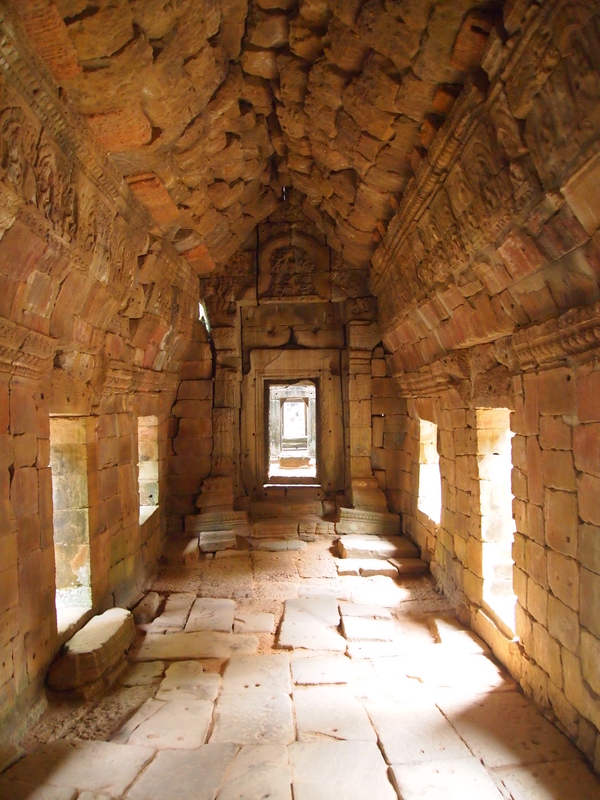 It’s a maze of vaulted corridors and jumbled stones, much like many of the other temples. At this point, I’m afraid these temples are starting to look a lot alike. I walk through quickly, as I planned, and exit through the opposite gate, as the driver had instructed me. I finish in 45 minutes. This gate of the temple is not on a main road and there are about 15 tuk tuks there waiting, but all of them are taken. These drivers are patiently waiting for their customers to return. But, as I feared would be the case, there is no sign of my driver. I wait and wait. Fifteen minutes pass and there is no sign of him. I am pissed now because I feel like he trapped me. If he had told me about this other fare he had from the beginning, I would have hired another tuk tuk from the hotel. But he waited until we were almost to Preah Khan before even telling me this. I don’t know what to do because I have no phone and I’m really out in the middle of nowhere. Finally, I ask one of the waiting drivers if he’ll let me use his phone. I call the hotel and tell the story to the manager. He is flabbergasted. “Why didn’t he tell me he had this other fare before he agreed to take you?” He assures me he will call the driver and find out where he is and call back. After awhile he calls back and says he talked to the driver and he is on his way, so I should wait. But he can’t tell me how long it will be. I wait 5 more minutes. By now I’m furious. 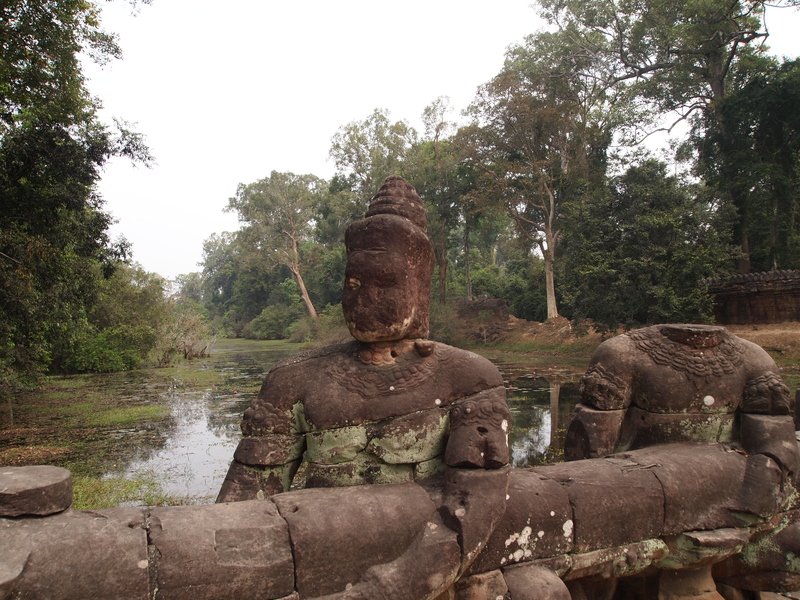 I ask one of the other drivers if they could take a few minutes to drive me to the next temple, Preah Neak Pean, on what they call “The Grand Tour,” which includes the lesser Angkor temples around the periphery of the complex. Finally one agrees that it will only take a few minutes and he’ll take me there for $2. I take him up on the offer. He drops me and I ask him if the guy from the hotel calls, can he please tell him I’m now at Preah Neak Pean. He says he will be happy to. 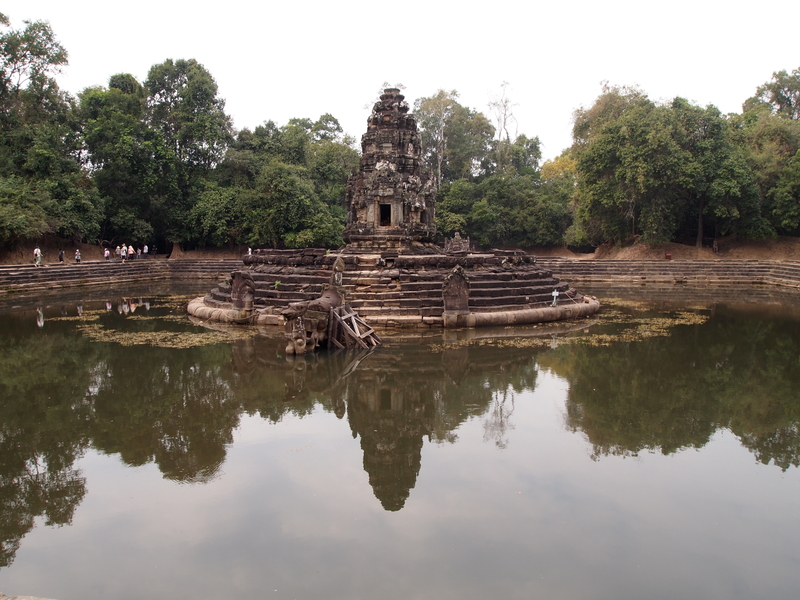 I wander around Preah Neak Pean, and there isn’t much here, just a square pool with a kind of island in the middle and some other square pools surrounding it. 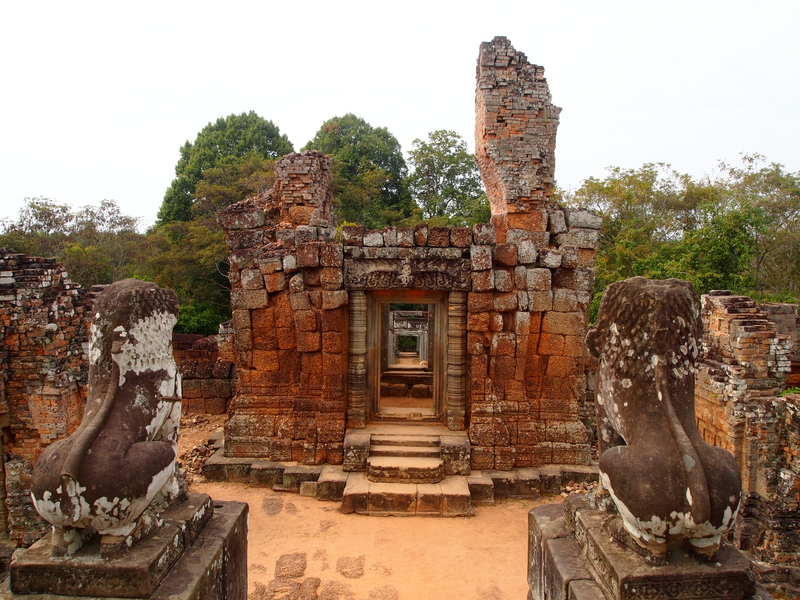 This temple is another built by Jayavarman VII in the late 12th century. I don’t even know why I bothered to come here. I return to the street and still no sign of my driver. I now see all the guys who were waiting at Preah Khan, and they say they haven’t seen my driver, nor have they heard from my hotel. So I ask again if I can use the phone, I call the hotel, and he tells me the driver is just now arriving at Preah Khan! I tell him I’m now at Preah Neak Pean and he assures me he’ll call the driver and have him head to me directly. We make a quick stop at Ta Som, another small temple built in the 12th century for Jayavarman VII. I spend most of my time here admiring and taking pictures of the intricate carvings in reddish stone. I’m hot and tired by this time and all I want to see is Pre Rup. 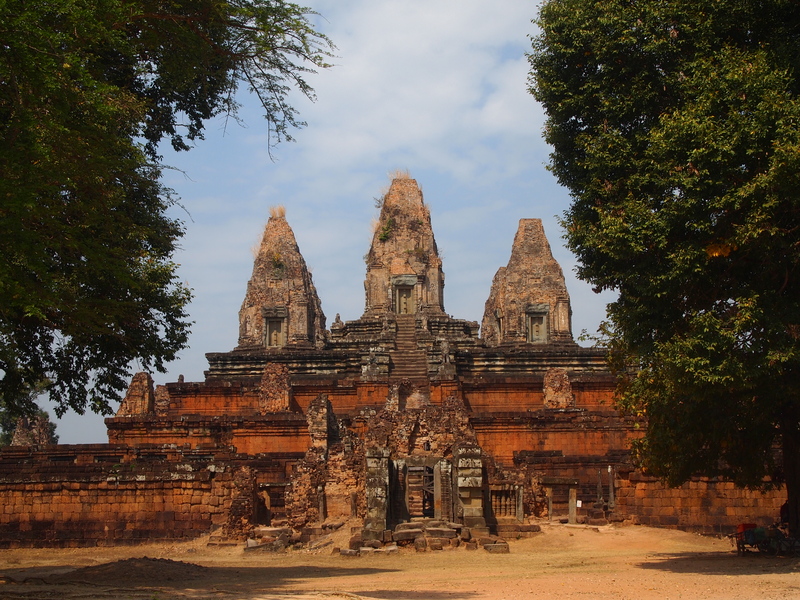 It’s a reddish-colored mountain temple, built for Khmer king Rajendravarman in 961 AD. It’s built of brick, lacerite and sandstone, and its pyramidal structures throughout have bushes and grasses sprouting off their tops, like tufts of silk on a corncob. I love the deep rich color of this temple in the sunlight. This, Banteay Srei and Ta Prohm are my favorite of the Angkor temples, for their rich beauty and their interesting features. I climb and climb the stairways to heaven at this beautiful temple. 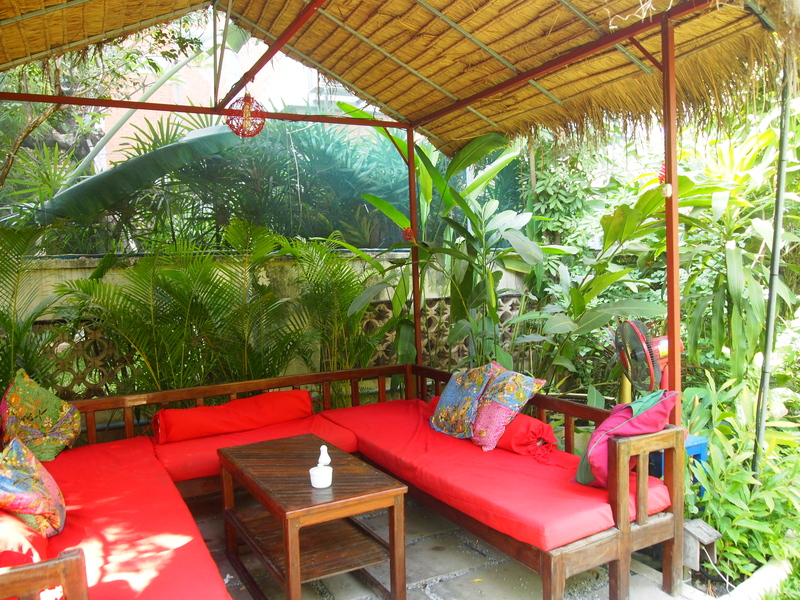 I’ve determined I want to eat lunch at Butterflies Garden Restaurant, which is a garden patio surrounded by netting to keep the butterflies afluttering within. I ask my tuk tuk driver to drop me off and I tell him I’ll find another ride home. I had planned to give him only $6 since I was so pissed at him earlier, but he’s been so penitent and kind since, that I give him $10 after all. How stupid is that, rewarding such bad behavior? I go into the garden courtyard, order a Pepsi and an omelette and enjoy the warm afternoon watching the few butterflies in the garden while I eat my lunch. Back to the hotel to pack. On the way to the airport the driver stops at Les Chantiers Ecoles, the school Mani had wanted to take me to the day my camera was acting up. This school teaches traditional Khmer artisanship to impoverished children, skills such as lacquer-making or wood-and-stone carving. 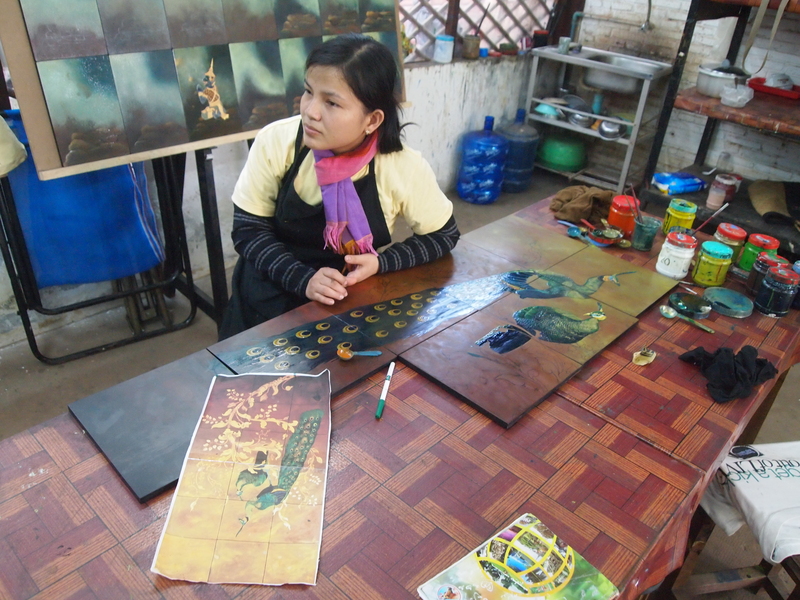 I watch demonstrations by the children, who actually look more like young adults, making various objects which are for sale in the high-priced attached shop, Artisans Angkor. I leave from the new Siem Reap airport around 7 pm, where they charge all foreigners a $25 exit fee (!). I’m supposed to have a 10-hour layover in my favorite airport, Guangzhou, but I’ve made no arrangements for sleeping overnight in China. As a matter of fact, I’m just planning to sleep in the miserable airport, in a test of my own mettle. I want to prove I can be tough. 🙂 However, when I arrive in Guangzhou, after much miscommunication with immigration, who disappears with my passport for a long time with no explanation, and with more miscommunications with the airline, I’m finally made to understand that China Southern will put us up for the night in a hotel. We drive in a bus for what seems like an eternity out into the mysterious city of Guangzhou, China, where I share a filthy, cold, miserable room with a Korean girl for about 3 hours of sleeping, only to get back on the bus again at an ungodly hour to catch the early flight to Seoul. 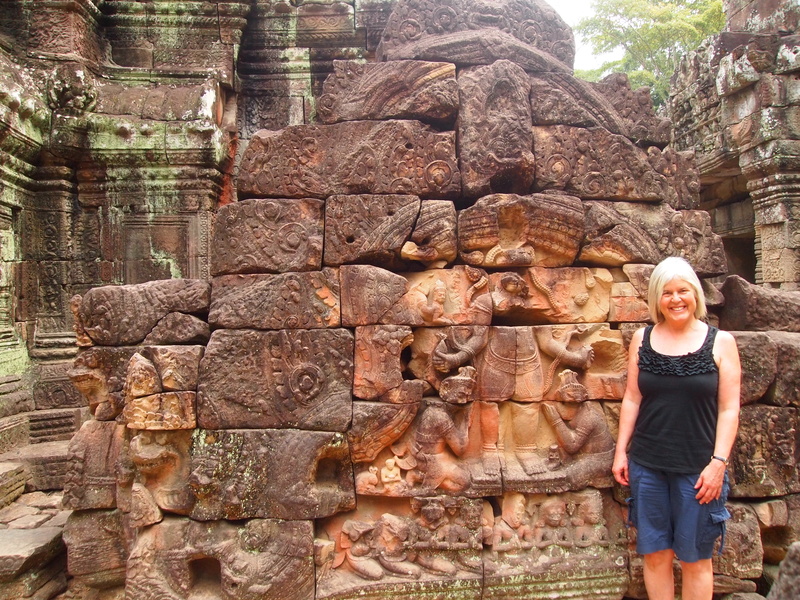 I adored Cambodia. Vietnam was fascinating and edgy. But never, NEVER, will I fly China Southern Airlines again! Taxi drivers! Yep I’ve had similar experiences and its so frustrating. I’m sure they see westerners and thing aha here’s another one! Yes Gilly! I think taxi drivers in foreign countries definitely try to take advantage of westerners!! Thanks so much, Jude. 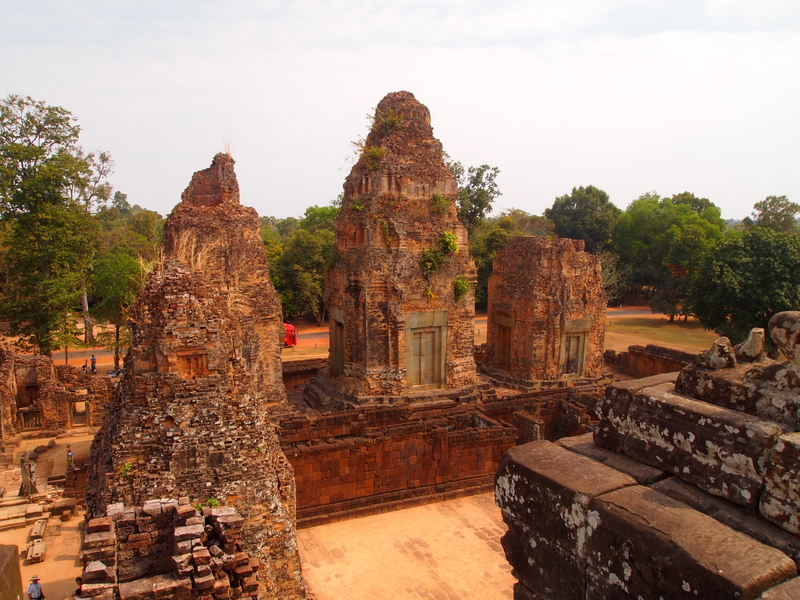 You would love the Angkor temples. I highly recommend Cambodia as a travel destination. It’s one of my top favorites! !